Gas hydrates have a crystalline form and resemble ice. 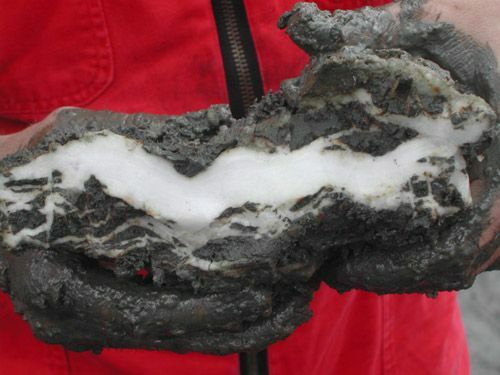 Gases are typically trapped within the hydrates, which can be found inside of permafrost or in sediments below the seafloor. The most common gas trapped inside of the hydrates (or clathrates) is methane. They are usually formed in cold, high pressure areas and have a compact structure, but if they are heated up, they decompress and tend to expand rapidly. The methane trapped within these hydrates is commonly referred to as natural gas, a common energy source used to generate heat and electricity. A recent survey of the Gulf of Mexico produced an estimate of 21,000 TCF (trillion cubic feet) worth of gas hydrates. Compare that figure to the 21 TCF annually used by the United States and you can see why gas hydrates present a literal gold mine to potential harvesters. The recovery of the gas hydrates is where the hazards begin. The natural gas is frozen but bringing it to the surface risks a sudden dissociation into gas and water, which would cause it to expand exponentially. Another risk is the fact that oil pipelines present ideal conditions for gas hydrates to form. This can clog up the pipeline leading to reduced flow or a complete blockage which would result in damage to the pipe itself. Gas hydrates can be removed after formation but it is a difficult and time-consuming process. A simplified explanation of the removal process would be raising the temperature within the pipeline coupled with lowering the pressure. Despite the proven methods, the removal process is time consuming and anything the slows down the flow, ends up costing money in the long run. A far more effective method is to block the formation of the clathrates before they have a chance to form. Depending on the likelihood of gas hydrate formation, the location of the pipe itself, and the cost involved, various mitigation techniques have been formed. Various chemical processes, such as glycol dehydration, have proven effective in decreasing the optimal temperature for hydrate formation. Other benign chemical additives have shown promise in shifting the flow to a lower temperature while at the same time increasing pressure. Still another technique involves chemicals used as inhibitors, lengthening the amount of time it takes for gas hydrates to form. 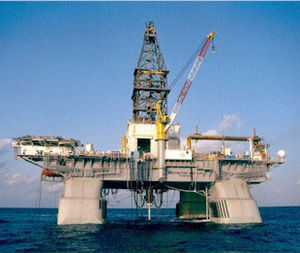 Standard offshore oil drilling stations face hazards from gas hydrates as well. Submerged in deep water, oil reservoirs can contain gas pockets that can get sucked into the well bore and form gas hydrates. The formations can then be intermingled with the oil, mud, and other fluids. The upward trajectory, combined with rising temperatures, cause the hydrates to dissociate as mentioned previously. This leads to a cycle of fluid ejection, increased pressure, and more potential hydrate formation. The ferocious ejection of fluid can lead to a scenario known as a “kick.” This type of situation was what exacerbated the BP Deepwater Horizon oil spill in 2010. As you can see, from collecting gas hydrates as a potential energy source, to avoiding the potential dangers involved in collecting other energy sources nearby, very real hazards are presented in oil and natural gas collection due to gas hydrates.